Mike and I on the White House lawn. I always wondered what it would be like to be invited to the White House. 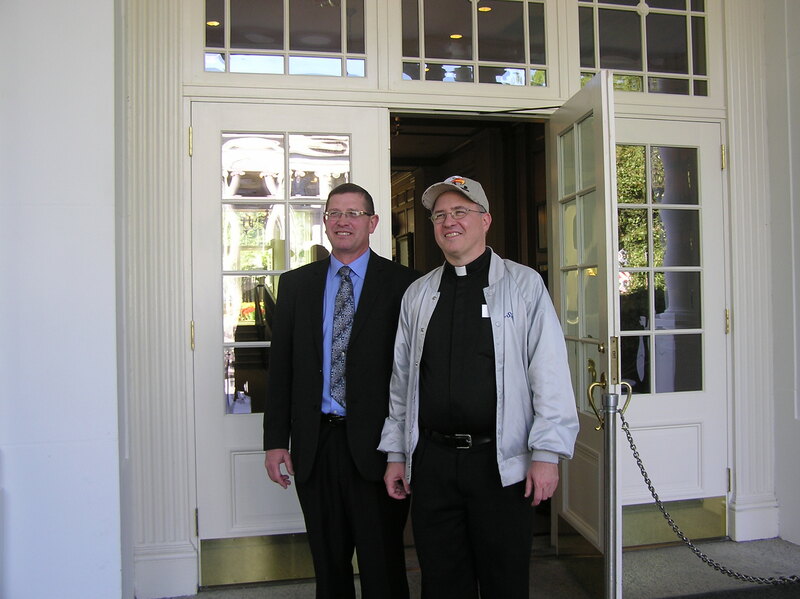 Thanks to the efforts of our food services director, Mike Renbarger, and the collaboration of so many of our staff, St. Joseph’s Indian School met the Healthy Schools Nutrition Challenge, and Mike and I attended a reception on the White House lawn. First though, we visited Senator John Thune’s office, and were given a great tour of the Capital from Katie, who lives an hour west of us in Murdo, South Dakota. She just graduated from Sinte Gleska University on the Rosebud Indian reservation with a degree in history, and is in DC taking part in an internship. She filled us in on the art and most especially all the history that’s taken place in the Capitol. We even saw the charred columns that witnessed to the burning of the White House during the War of 1812. Rachel, a young woman from Chamberlain, South Dakota joined us for lunch. She is a research and policy aid, working on important issues such as health care and education, and enjoyed talking to folks from home. We also squeezed in one hour at the American Museum of History. Seeing the actual chairs and table Grant and Lee sat in at Appomattox Courthouse and Geroge Washington’s dress uniform were treasures that spoke countless words. Also on display were remnants from the Battle of The Little Bighorn. 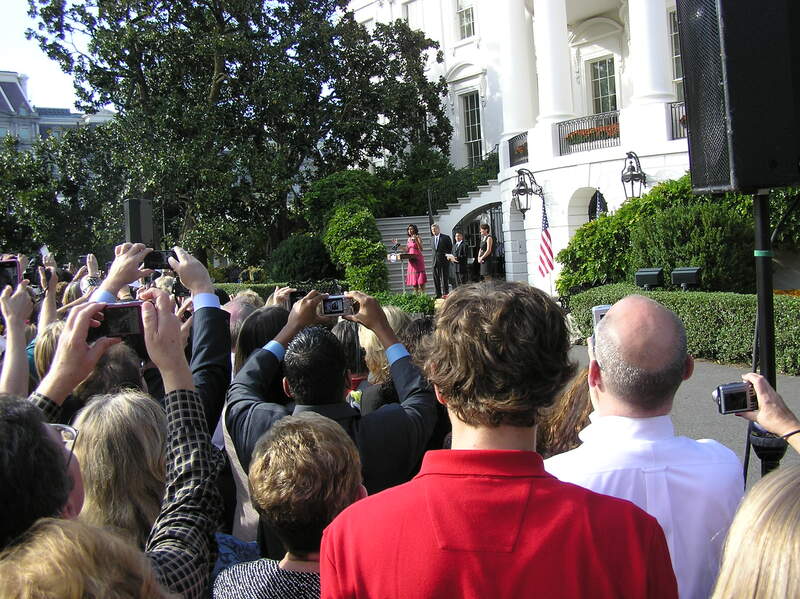 We did have a long wait to get in to the White House, including three separate ID checks and then a security screening. But we were joined in line by so many great folks dedicated to education that conversations easily flowed and time passed quickly. The folks behind us from Turlock, California ran an alternative high school, trying to provide hope for youth who would have otherwise dropped out. A local teacher from DC taught her students about health and nutrition and the difference that can make. Many spoke of the cuts in education spending, and how they are still trying to do more with less and improve the lives of children. My parents were both teachers; I have great respect for the work they do under often trying circumstances. All hands were raised with a camera when First Lady Michelle Obama started her speech. We arrived to the sweet strains of country music being played by the Marine and Navy bands, who were good enough to pass for Nashville studio musicians. Tents on the lawn were set up with fresh crisp apples (what else would you serve a teacher?) and sweet and ice-cold apple cider. It was surreal standing in front of the building that so many of us have had indelibly burned into our psyche from countless news stories and signing ceremonies, joyful times and national tragedies. After hearing from Secretary of Agriculture Tom Vilsack, a school administrator from Mississippi who helped her whole district achieve the gold award spoke of their efforts. A 12-year-old student from Chicago told us how he has benefitted from the program. Mike was actually close enough to the podium to receive a congratulatory handshake from the First Lady! He joked that from now on, he’ll only eat healthy food with that hand! Of course, you know that we will soon be seeing “Digital Education” from Coast to coast soon. You WILL be following that plan..of course. This is an adventure to be treasured…CHERISHED! as most do not get the privilege of attending something like this. With all of the controversy of good and bad at the White-House…..there is always something to good to hear and learn, if you are hungry for it.– The HEALTHY eating should have been heard loud and clear….some just don’t WANT to listen. The person that says….”I WILL DO IT MY WAY”…is the FOOL. The one that seeks counsel -wise counsel- IS the WISE one.– No-one is too old to learn. But we have to listen. What a wonderful experience! I am thrilled for you and Mike that you got to be there and take part in it all. As Cynthia says, an adventured to cherish, and a lifelong memory was born of that experience. I confess, Fr. Steve: I’m envious! Congratulations to you, Mike and all at St. Joe’s.